That reminds me, I need to do a backup. 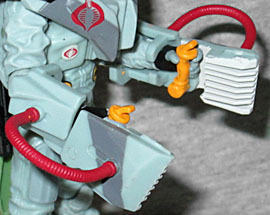 Data-Vipers are technology experts who use advanced tech gear to attack, sabotage and spy on the GI Joe team. Using an attack drone, a Data-Viper prepares to strike a GI Joe squad, but the GI Joe team spots the drone and opens fire! 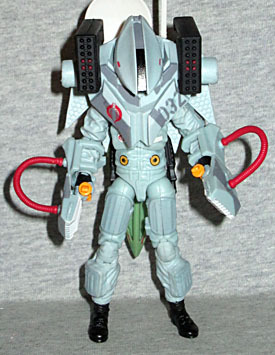 The Data-Viper was originally intended to be part of the GI Joe 30th anniversary line, before Hasbro screwed the pooch on that one. Seriously, some of the best-looking Joe figures to date, highly anticipated by fans, and finding them was harder than Snake-Eyes' master. And thus, like Kwinn the Eskimo, the chracter got shuffled into the sputtering end of the Retaliation toyline, so while you don't have to buy stolen factory samples of him, don't expect to ever see him in a store, either. Given the bio up above, it seems like the Data-Viper is an update of the Tele-Viper - though not in the same way the Jungle-Viper was an update of the Night-Viper. This is more about replacing the job function than improving the costume design. To that end, the Data-Viper comes with a whole slew of equipment to help him with his work. Yeah, we're reviewing his accessories first - starting with the attack drone mentioned on the back of the card. It really is a little UAV, just over 3⅛" long and featuring articulated wings that will fold away when you don't need them. 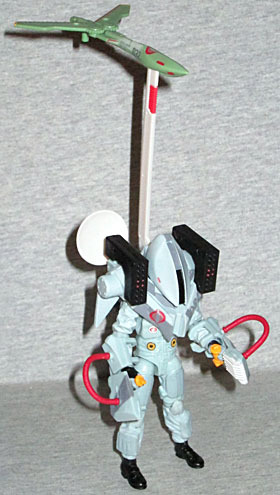 It's sort of a pale green, with red and yellow paint detailing and a peg so it can fit into a figure's backpack hole. The set includes two guns that the Data-Viper can wield himself, or can be plugged under the drone's wings to give it some firepower. The Data-Viper wears large armored gauntlets that have articulated yellow handles at the end. Those fit into his hands, and we can assume they let him pilot the UAV. Red tubes run from the forearms to blade-like devices that hang over the hands (but can be swiveled away if you so choose). What are those? No clue. Maybe they interface with computers somehow? Like, they plug in or something? I don't know, it's a fantasy war toy - make up whatever function you want for them! DV has a large chunk of armor that covers his head and shoulders. It's giant and angular, like he's wearing a stealth bomber around his neck. There are big rocket launchers mounted over each shoulder (because why not? ), as well a radar dish and a tall, thin antenna on his back. Those are all mounted on balljoints, so you can pose them however you want, and the guns mentioned before can be plugged into the back, as well. In fact, the drone plugs into the back as well, so really, every single thing the figure comes with can be held at one time by the toy - that's something we always like to see (and it's the mark of good planning). Yeah, toys that come with a lot of gear can be fun, and impressive to look at, but it doesn't mean much when most of those accessories end up laying on the ground or forgotten in storage. If you remove the Data-Viper's slightly technological Pyramid Head helmet, he still doesn't have a normal face underneath it. Rather, there is a second, more form-fitting, black-and-white helmet beneath it, with four red slit "eyes" on the white panels. The idea is that he's enclosed in this helmet, being fed 360° sensory data from the drone. A new body was designed for the Data-Viper, and it's looking pretty good. Once you get past the crazy helmet, it's basically just a standard work jumpsuit, baby blue and covered in pockets. The ones on his shins look like they have tools in them, and the pads on his thighs probably protect him from overheating laptops. Done in different colors, you could easily see this being a generic workman anywhere on Cobra Island - maintaining cars in the garage, touching up the paint on the giant Cobra logos on all the buildings, resetting the tripwire mines in the sewers, whatever. 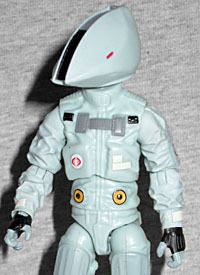 The figure has all the usual modern GI Joe articulation, plus all the joints we mentioned on his armor and accessories. What's really impressive, though, is that even encumbered by a lot of top-heavy gear, he's still quite stable. Yes, the figure includes a display stand (shaped like a generic rounded dog tag), but he'll stand up just fine without assitance. Of course, if you can't get him to stand, you can always use his antenna thing as a tripod. Tele-Vipers used to be field communication experts - glorified telephone operators, basically. But now that that function can be filled by a satellite phone, I think of the Tele-Vipers more like Cobra's IT Department: they tell you to turn your computer off and on. And if that's the case, the Data-Vipers are high-end programmers. Instead of having a central database, Cobra uses the Data-Vipers like a botnet, a self-contained, mobile network that has the DVs as its hubs. They're a living peer-to-peer network, and Cobra's data is the torrent - if one is killed or captured, all the data remains intact, spread among all the rest. It's a really clever idea, and the Data-Viper has a unique design. In a perfect world this toy would have been released last year as part of the RAH line - or even this year as part of the Retaliation line, but in stores instead of not. He deserves a place alongside the Hazard-Viper, the Zombie-Viper, and all the other new characters.